Last night delivered some good results — and some disappointment — for transit-related ballot initiatives around the country. The biggest disappointments came from Los Angeles, Memphis, and Houston. A measure to continue the half-cent sales tax for transit in Los Angeles County until 2069 was narrowly defeated, falling less than two percent short of the two-thirds majority needed for passage, Damien Newton reports at Streetsblog Los Angeles. Mayor Antonio Villaraigosa had championed Measure J, which would have raised revenues to accelerate the pace of construction projects like the West Side Subway. But a coalition of bus riders and other interests who don’t fit the “anti-transit” label opposed the 30-year measure, saying the projects favored new construction over existing riders. Still, the referendum got a “yea” from 65 percent of voters — a clear majority, but not quite the two-thirds vote required in California. Meanwhile, residents of the city of Memphis rejected, in a 60-40 vote, an innovative measure to impose a one-cent gas tax hike to fund transit improvements. The measure would have generated between $3 and $6 million annually to shore up the city’s bare-bones transit system, the local ABC affiliate reports. Memphis is unusual in having the authority to impose its own gas tax, separate from state and federal gas taxes, but it appears that resident declined to use that authority this time around. Transit suffered a loss in Houston as well. The region’s voters upheld Metro’s policy of diverting one-quarter of the revenues collected for transit to road projects. The measure was opposed by transit advocates like Houston Tomorrow‘s David Crossley, who argued that this transfer has cost the Houston region $2.7 billion in transit improvements over the past 35 years. On to the good news: There was cause for jubilation in Virginia Beach and in Orange County, North Carolina. 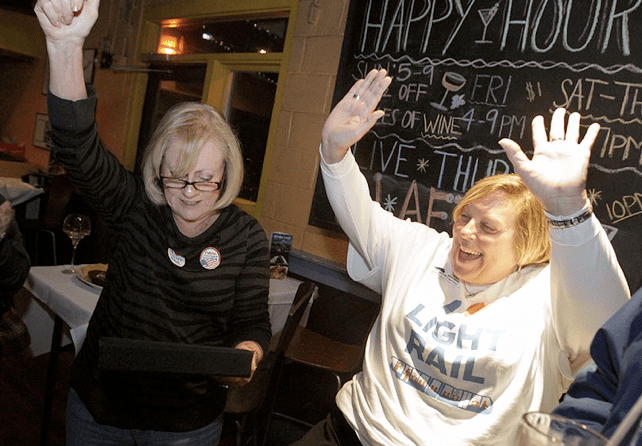 Light-rail supporters, who gathered at an Oceanfront restaurant and wore matching shirts emblazoned “I (heart) light rail,” let out periodic cheers and pumped their fists after hearing early results. Meanwhile, voters in Orange County, North Carolina, home to the city of Chapel Hill, approved a half-cent sales tax for transit. That community was being watched by transit observers around the country because it is the second of the three “Research Triangle” cities to approve a tax increase for transit. Orange County voters’ approval leaves only Raleigh’s Wake County to approve a tax hike that would fund a light rail system connecting the three cities. “With today’s vote of confidence, two out of three counties served by the Transit Triangle are expanding their bus networks locally and regionally and beginning work on a light rail connection between Chapel Hill and Durham,” Transit Triangle’s General Manager David King, told the local newspaper. Wake County opted not to hold their referendum on the transit tax this year, but the victory in Orange County makes it almost inevitable that Wake will pass theirs as well. For more referendum results, see the Center For Transportation Excellence’s website and stay tuned here for more analysis.